NEW PRODUCT: Very hot! Limited stock available now. 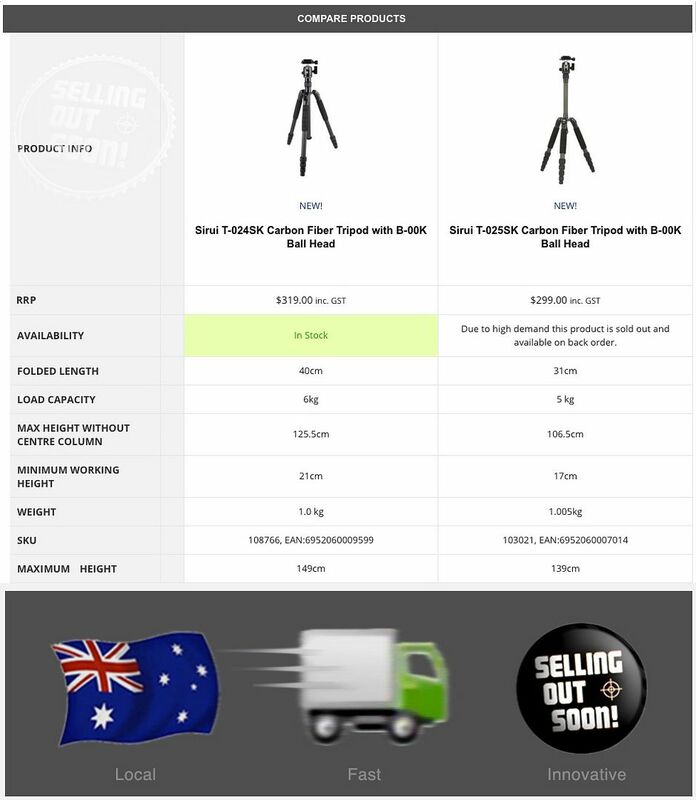 Selling Out Soon has achieved the World's Best Price for Sirui tripods and is delighted to offer you this latest model at the best price in Australia for official stock. Order now, before stock runs out - we know you'll love our service, and you'll enjoy the full Australian 6 year warranty too! "The T-024SK tripod is the best travel tripod Sirui have made and we expect it to be the new king of Sirui Travel Tripods"
"The T-024SK + B-00K is an ultra lightweight (1kg) and extremely portable solution. It includes a centre column that can be raised or lowered which gives you an extra 19cm in height, and an increased load capacity, from 5 to 6kg over the Sirui T-025X! We also provide the new B-00K ball head out of the box, so you're ready to go, when you're on the go. A very proud addition to our Sirui family, for those who want the ultimate ultra-compact lightweight companion to take with you everywhere you're going. Once you feel how light and easy it is to carry, you'll never want to go anywhere without it. The previous model proved that, and with the increased load capacity and dimensional advantages, we expect this tripod kit to meet the needs of more Australians than any other tripod to date." Genuine Australian Stock means you won't get stuck with old stock from the USA or "replica stock" from Asia. "The Sirui T-024SK Carbon Tripod with B-00K Sirui Ball Head – super-compact, and extends further than other models, yet is extremely stable." This high-quality new model Sirui T-024SK travel tripod replaces the discontinued T-024X, and offers more secure support for your compact or system camera despite its compact design. It is easy to handle in any situation and can be packed into any bag. The legs can be folded up by 180° meaning that the tripod can be collapsed to a height of just 40cm (without head). Each leg is made of 4 sections with 3 sealed twist locks. The rubber feet ensure the tripod is steady on all surfaces. Cold-weather grips are a SIRUI standard, as is the practical transport bag. The T04X Series features a adjustable centre column. For additional stability, there is a small hook on the centre column to mount a weight. Only our official product comes complete with the full Sirui 6 year Australian warranty! Because Selling Out Soon is authorised to sell this official Australian Sirui stock, you're getting the real Sirui product here. Be absolutely sure of the true Sirui experience and that you're getting what you pay for. Because ours are not those very good-looking (but illegal and generally useless) fakes. You'll also have the peace of mind of Sirui's full 6 year Australian warranty, so in the odd event of any technical or fault issues, you'll receive first class help immediately - here in Sydney, not overseas. This is official product complete with 6 years manufacturer's Australian Warranty. With our product, you will NOT need to send your item back overseas if there is a problem, warranty claims are handled in Australia. If you have bought this product from overseas, OR from any seller in Australia other than sellingoutsoon.com.au, no spare parts are available, and no warranty claims are valid in Australia. The warranty on this product is supported on official Australian product only, such as this, because you are purchasing through the authorised Australian channel for Sirui. Cancellations are not possible, and all information on this page forms an addendum as to the agreed terms of sale. High demand and/or low stock items may take longer than normal due to fulfilment schedules. We maintain a high degree of scheduling discipline, keeping buyers properly informed, while allowing more buyers access to new Australian stock at the best possible price.